Romero (4-4, 3.10 ERA) was likewise emotional. He marked Ryley’s initials on the mound and referred to them often during a sterling performance that moved the Jays to within 2.5 games of AL East-leading Tampa Bay. 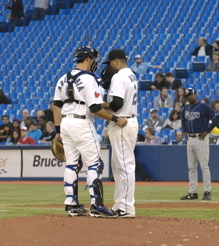 JP Arencibia and Ricky Romero talk things over in the seventh inning. “Every time I looked at the back of the mound I kept on looking at his initials, just remembering the time we were playing in front of that dugout, the smile he had. It’s definitely something you carry with you forever,” he said. Romero, who fanned six, went seven innings, allowing three hits, one earned run and two walks. 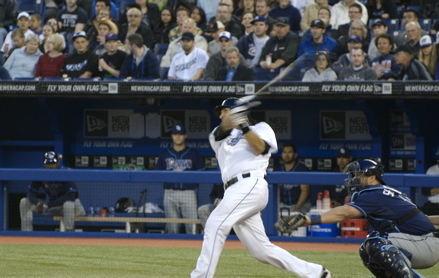 He left with the game tied at 1 and Arencibia’s shot with Juan Rivera on base put the Jays up 3-1. Arencibia, who finished 2-for-4, said he got his teammates to a sign a ball from the game for the Martin family. The usually reliable Marc Rzepczynski surrendered a homer to Kelly Shoppach in the eighth before Frank Francisco pitched a 1-2-3 ninth for his fifth save. The Blue Jays (22-21) have won seven of eight and will host Houston (15-29) in an interleague series this weekend. 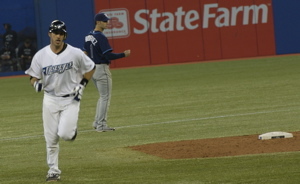 JP Arencibia circles the bases after his two-run shot. FYI: Pics are by AB and they’re copyrighted.